When we need to find where the acupuncture points are, we have a special way to measure where they are on our body. To do this we use our own body, not a ruler on another external measure, not inches, centimetres, etc. We use our own body as the measures are proportional to us. Look at you thumb. The first section, across the joint is 1 Cun. Cun is like an inch. Another way to find it is to touch the tip of your thumb and middle finger together to make a circle and between the first and second joint of your middle finger is also 1 Cun. When we put our index and middle finger together, sideways across the middle joints is 1.5 Cun. From the tip of the index finger to the second joint is 2 Cun. Across the second joint of all 4 the fingers put together is 3 Cun. 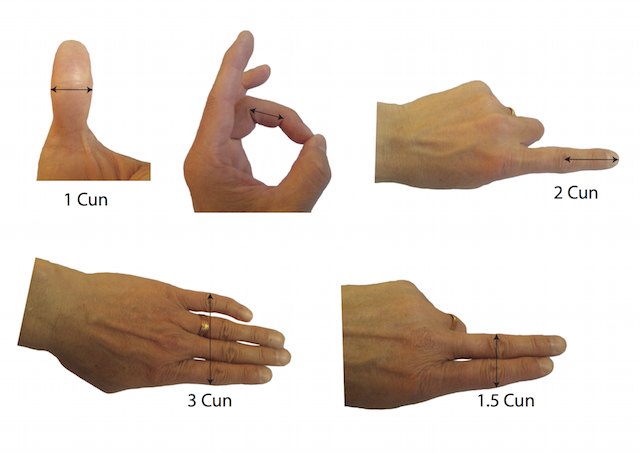 So we can measure the location of the acupuncture points with the fingers. Sometimes we use other ways. For example, when we find the Hegu Point合谷穴 on the back of the hand, we put the tip of our thumb in the “v” where the thumb and index finger meet. The area under the thumb is the location of the Hegu point. So we need to know our bodies well.